When you're thinking to replace the suspension on your vehicle, it is better to go with aftermarket suspension system that is truly capable of off-road use. Skyjacker is one manufacturer that has a long track record of producing high quality suspensions for the past decades. They have been in the automotive industry for more than 35 years, and in that time they have had thousands of satisfied customers and many industry awards and recognitions. Do not miss the opportunity to get your cash back with Skyjacker! 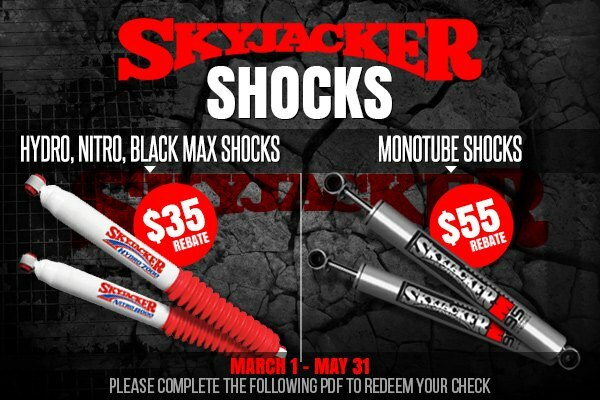 Purchase 4 Skyjacker Hydro or Nitro Shocks and get a $35,00 cash back rebate, buy 4 Skyjacker Monotube Shocks and receive a $55,00 cash back rebate. Act now, this offer expires on May 31, 2015.